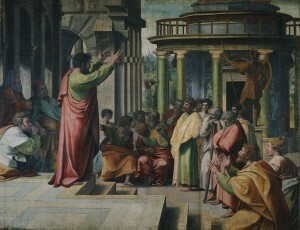 Saint Paul wrote that he was “all things to all people.” Paul was a Jew, a Roman citizen, a Pharisee, an apostle, a preacher, a teacher, a tentmaker, and an evangelizer. And Paul was a writer. Thirteen of the twenty-seven books of the New Testament are attributed to him, making him a prolific composer. He was as much a writer as the evangelists, and the frequency of which his letters appear at Mass each Sunday emphasizes the importance of his writing theologically, historically, and linguistically. He is an integral access to the body, soul, and divinity of Christ and as such we should continue to study and to listen, to love and to hear him out. The prayer card I chose to commemorate my ordination to the priesthood in June bears an image of Paul and a passage from his Epistle to the Romans. The front of the card depicts Paul sifting through his papers while writing a letter as he contemplates the face of Jesus reflected off the surface of the desk. On the back of the card is the verse: “I am not ashamed of the gospel; it is the power of God for the salvation of all believers.”  Paul was happy to have a free moment to collect is thoughts and define his doctrine, as he did carefully through letters. This was how he developed and solidified his ideas, committing his sermons to ink and paper for publication to his churches. If he was imprisoned, he dictated to a faithful scribe, confident that even behind bars the Word would be proclaimed. It wasn’t difficult to come up with an appropriate card for my ordination. New priests choose saints for their cards to engender the spirit with which these holy men and women served Christ and helped to build the kingdom on earth. Paul was loyal to God and deeply learned in the Scriptures, and I wanted to raise awareness of the significance the Paul’s letters, so important to our Catholic spiritual tradition, and to draw more attention to the life and writing of Paul. Letters interest me. I have always felt captivated by the epistolary genre of literature, or stories told through letters, ever since I learned of the form in Catholic school. I do not think that Paul thought of himself as a “man of letters” crafting literature that would be immortalized for the ages. He wasn’t looking to make the best-seller’s list. The use of the letter as a medium of Divine Revelation became standardized during the first century when Paul and his contemporaries—most notably Peter, James, John, and the writer of the Epistle to the Hebrews—utilized it to evangelize. Writing under the direction of the Holy Spirit, Paul addressed specific challenges in the nascent churches with a timeless and universal perspective borne from his knowledge of the Greek Bible (Septuagint) and revelations experienced through prayer. Ever since Jesus revealed himself to Paul near Damascus (Acts 9:1-9) the apostle continued to seek the face of the Lord every day for the rest of his life. The face Paul saw at his desk was leading him toward where he that reunion. Knowledge of Paul, his life and his work, can be gained from studying The Acts of the Apostles, written by Saint Luke, and from Paul’s own letters. In Acts, Luke produces a faith portrayal of Paul, the indefatigable missionary who works tirelessly to share the Good News. Interestingly, Luke makes no mention of Paul the letter-writer. Rather, he presents Paul as a literary/theological hero who submits to the Holy Spirit, which guides Paul throughout his journeys to build the Church. In the letters themselves, we get a more subjective view, a reading of the heart and soul of a man who labored intensely for God and his people, despite many trials and travails (see 2 Corinthians 11:21b-29). Prayer and study remain indispensible for connecting with the life and writing of the saint, a true pearl of Christianity worth purchasing at any price (see Matthew 13:45-47). Greater knowledge of, and love for, Paul as a missionary of Jesus means greater love for Jesus, Paul’s beloved friend and master, for whom he labored so obediently until he was martyred by the Roman emperor Nero in AD 64. The word “gospel” means good news. God’s mercy and love is revealed in the salvific action of the life, passion, death, and resurrection of his Son. It was this good news that Paul proclaimed to the world; everywhere he went, in everything he did, he told people about Jesus, either before the Athenians or while sitting in the marketplaces making tents. Through his preaching and his letters, Paul helped to change the world. He wrote his own book about Jesus, pieced together by his letters and the sermons captured by Luke in Acts. Jesus, the face he saw in the desk, was always the object of Paul’s evangelizing. One of the greatest reforms from the Second Vatican Council was the creation of the three-year lectionary cycle, which gives Catholics greater exposure to Scripture—“the treasures of the Bible are opened to us.”  A “semi-continuous reading” means much of Paul’s work is read in its entirety, giving hearers of the Word greater understanding of the saint’s theology and his vision of the Church. Despite the frequency, the passages can seem like they come in ‘soundbites,’ snippets of verse that can be misunderstood. Compared with the parables of Jesus or the traditional narratives from the First Testament readings, Paul’s work can appear abstract. Yet many important ideas in our Church originated from Paul’s epistles: the three virtues of faith, hope, and charity; the body of Christ; justification; and predestination. Text is context. Careful study of these passages can explain the meaning of Paul’s writings. It is necessary that we who are hearers of the Word become doers of the word and that we take the pearls we receive from Paul and share them with the world. Paul is not so much cheering us on to the finish line as he is prodding us step by step to complete the race, which he knows is ours to win. “Ignorance of scripture is ignorance of Christ”— this familiar saying from bible studies is attributed to Saint Jerome, the premier Catholic scripture scholar. Similarly, ignorance of Paul’s writings and his life constitutes a loss of understanding of Christ. To the Apostle, his life and that of Christ’s were one. “I have been crucified in Christ; yet I live, no longer I, but Christ lives in me” (Galatians 2:19b-20a). No Paul, no Jesus. Know Paul, know Jesus. Study the life and writings of the saint to know the One who captivated his imagination. Sacrosanctum Concilium (1963) No. 24. Witherup, Ronald D., SS. 101 Questions and Answers on Paul. New York/Mahwah, NJ: Paulist Press, 2003.